We want to create a perfect user experience, that's why we take great pride in delivering premium quality products supported by prompt technical service. We are at your service! Learn all about SINH™ products and services, get technical details and basic instructions. Or contact our technical support team for installation support. Can I use screws for applying SINH™ board? Yes. However, all screws that are used for installing SINH™ board are recommended to be stainless steel, especially for external use. For screwing on steel frames we recommend using Countersunk Ribbed Head screws. For screwing on wood frames we recommend using Countersunk Bugle Head, class 2/3 needle point screws. Can SINH™ board be cut? Yes. SINH™ boards can be easily cut, trimmed, drilled or shaped using ordinary (power) tools. We would recommend a saw with Tungsten Tipped Carbide blade. Can SINH™ board be painted or plastered? Yes. SINH™ board can easily be painted or plastered, because of it's good adhesive properties. Before applying paint or plaster SINH™ board requires priming on face and edges with a suitable primer in accordance with product instructions. Following extensive testing acrylic based primers have been proven to work best. Do you need special tools for applying SINH™ board? 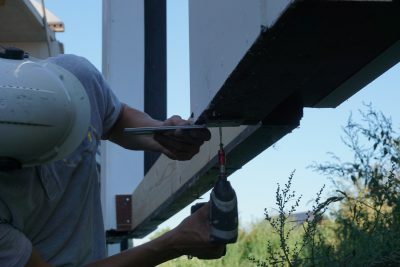 No special tools are required for applying SINH™ board. Does SINH™ board accomodate the growth of mould or fungi? No. thanks to its open molecular structure and high permeability to vapour, SINH™ board does not accomodate the growth of mould or fungi, and does not support insect life. Therefore, SINH™ board underscores a healthy environment. Does SINH™ board contain toxic materials? No. Products fabricated from SINH™ board are non-toxic and asbestos-free. How should SINH™ boards be stored? SINH™ boards are delivered on clearly labeled pallets, wrapped and packaged to prevent weathering and edge damage. SINH™ boards should be stored flat on a pallet, in dry conditions and indoors. Boards should not be leant upright for long periods of time. Whilst stored moisture should not be allowed to drip on to or infiltrate between stored sheets to prevent surface staining. Boards should always be lifted by 2 people, not dragged across each other to prevent unnecessary product damage. Is SINH™ board fire resistant for 60 minutes or more? Yes, SINH™ board products are incombustible (Class A1). When applied correctly, 9 mm SINH™ board can easily attain more than 60 minutes’ fire resistance (conforming with EN 1364-1: R015). This enables building contractors to comply with the most stringent of fire-safety requirements. Is SINH™ board suitable for CNC cutting? Yes. SINH™ board can be easily machined with computer numerically controlled (CNC) technology. And because sharp corners can also be machined in SINH™ board, the design options are endless. Is SINH™ board water resistant? Yes. SINH™ board is waterproof and damp-proof. In fact SINH™ board is completely water resistant and dimensionally stable in high humidity conditions. In addition to this, SINH™ products do not bread down when immersed in water or exposed to freeze/thaw cycles. Should I use a jointing space when applying SINH™ board? Yes. Make sure there is enough space between the SINH™ boards when jointed. This prevents friction. Recommended: board size / 2 (9mm board / 4mm jointing space). Will SINH™ board support fittings? Yes. Light fittings only such as toilet roll holders, shower curtain rails, small vanity mirrors / shelves, pictures etc with appropriate screws and rawl plugs. Not grab rails, cabinets etc which must always be fitted into supporting dwangs/ noggins. What are the possibilities to finish SINH™ board magnesium oxide boards? How to construct a drywall? A step by step video tutorial. See how easy it is to build a drywall partition using magnesium oxide boards.